Claiborne, Alabama, is a ghost town—no residents remain today. The town experienced its heyday more than a century ago, when cotton was king and its location on the Alabama River made the town an important and prosperous trading center. Named after General Ferdinand Claiborne, who built a fort there in 1813, by 1820, Claiborne’s population had reached between 5,000 and 6,000—making it one of the biggest cities in the state. The area was rich in cotton, wheat, corn, and rice, and boats carrying these commodities stopped at this bustling port nearly everyday. The town's proximity to Cahawba, the state capital from 1820 to 1825, also added to its importance. ​Jews arrived in Claiborne by the early 1840s. Like in other Southern towns, Jews came to Claiborne as peddlers and rural merchants. Their first act as a Jewish community was to acquire land for a cemetery in 1843. By 1846, the Jews in Claiborne had requested a Sefer Torah and expected to worship together for the High Holidays. Around 1853, the congregation, known as “Claiborne Congregation” had fifteen members. Leopold Maas functioned as the chazzan (service leader), shochet (kosher butcher), and mohel (ritual circumciser) for the congregation. An immigrant from Bavaria, Maas owned a store and raised six children in Claiborne. Claiborne began to decline with the arrival of yellow fever and cholera epidemics. The Civil War also took a heavy toll when Union soldiers occupied the town and looted much of its contents. While the town continued after the war, many of Claiborne’s merchants moved away. By 1872, only 350 people remained. Railways expanded across the South after the Civil War, and interior river towns like Claiborne were supplanted as train travel allowed for more efficient and predictable shipping for the region’s crops. Claiborne’s fate was sealed when the railroad came through Monroe County and bypassed the town. When Claiborne began to decline, most Jews moved south to Mobile. The Rothschild family was one of the last families to remain in Claiborne. Kossuth Rothschild operated K.E. Rothschild & Co., a general merchandise store that was still in operation as late as 1916. By 1920, no Rothschilds remained in Claiborne. Though there were a small number of Jews in Claiborne, they made significant contributions to Alabama history. The sons of Leopold Maas were active Alabama citizens. Simon Maas eventually moved to Selma and served as president of Congregation Mishkan Israel there from 1885-1902. He also served as Mayor of Selma in 1887. Charles Maas fought for the Confederacy during the Civil War. Claiborne brothers Louis and Abraham Klein also fought for the Confederacy, moving to Mobile after the decline of Claiborne and operating a clothing store called A.&L. Klein. Julius Jacobson served as a private in the Alabama infantry during the Civil War. Jacobson’s brother Morris was a Prussian immigrant who operated a dry goods business and was considered a leader in the Jewish community. After the Civil War, Nathan Feibelman moved to Claiborne and served as postmaster from 1869 to 1871. He also partnered with Meyer Metzger in the operation of Metzger & Feibelman. Today, the only signs of what was once a vibrant Jewish community are the gravestones in the cemetery, which has been inactive since the last burial in 1899. 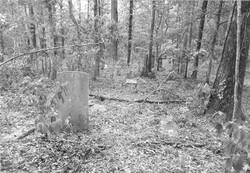 Currently, the Claiborne Jewish cemetery is in good condition. In 1967 it was vandalized and in the years since weeds and brush covered most of the gravestones. 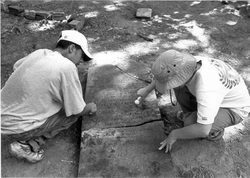 In 2000, eighty-five rising high school freshmen and sophomores from the Henry S. Jacobs Camp in Utica, Mississippi helped to restore the cemetery by clearing brush and uncovering the graves. Thirty-two graves were revealed. There may be no Jews left in Claiborne, but its history illuminates important aspects of Alabama Jewish history. Claiborne’s Jews showed strong support for the Confederacy, assimilated easily into the local merchant class, and showed a powerful desire to maintain their religious traditions, despite their small numbers.